The entrance to Marine Corps Air Station Miramar. Marine Corps photo. A wildfire that blackened swaths of hilly open terrain in the northeastern reaches of Marine Corps Air Station Miramar was fully contained Saturday evening. 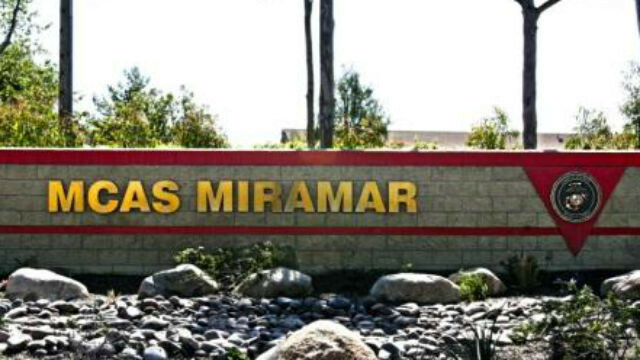 The blaze erupted for unknown reasons about 3 p.m. Friday, according to MCAS Miramar public affairs. Fire crews reported no change in acreage overnight into Saturday, base officials tweeted around 9 a.m. MCAS officials reported that as of 6 p.m. Saturday the fire was fully contained. The spread of the fire had been halted at roughly 100 acres by late afternoon Friday, officials said. Crews with the San Diego Fire-Rescue Department helped base firefighting crews extinguish the blaze, which was posed no structural threats, Capt. Matthew Gregory, director of communications for the northern San Diego USMC station, said on Friday.